Lawmakers punish Savchenko for clandestine talks with warlords. 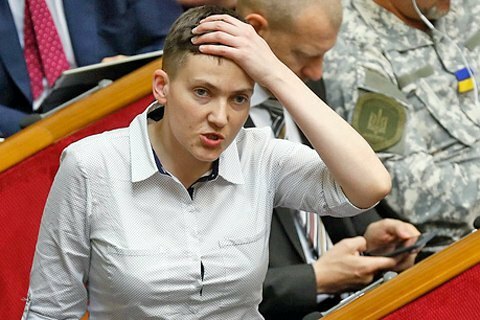 The Verkhovna Rada on 21 December cancelled its 2014 resolution on the extra-quota election of MP Nadiya Savchenko to Ukrainian delegation to PACE. Savchenko was included in the PACE delegation in late 2014 to provide her with the international parliamentary immunity, when she was imprisoned in Russia. The formal basis for today's decision of the parliament was that Savchenko does not need immunity any longer. In fact, Savchenko was expelled from the delegation for her clandestine meeting with the militant warlords earlier this month. Savchenko visited Minsk on 7 December to secretly meet with the leaders of terrorist organizations "DPR" and "LPR". On 12 December, Savchenko said the meeting was in "the tripartite Minsk format" and was attended by some Russian representatives, and Zakharchenko and Plotnytskyy from the "DNR" and "LPR" respectively. Savchenko was also ousted from the Fatherland faction.